In stock 210 pcs. Also available in our walk-in store. 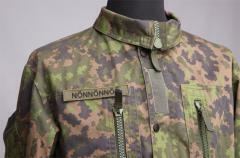 If you haven't served in the Finnish military, you won't probably appreciate the funny in this. The deal is, that when you get chewed in the FDF, or when somenody just doesn't care to check your name, you'll be called "Nönnönnöö", as proper military etiquette requires the commaning person to address everybody by their name, and this sort of does it. Nönnönnöö doesn't mean anything, it's just "Yada-yada-yada", except a bit more demeaning. You didn't get it. Yeah. We knew it.